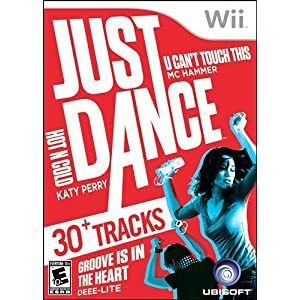 Game company Ubisoft has released a new game for the Nintendo Wii called Just Dance. Just Dance is another one of the many new games on the market designed to get your heart rate up. Unlike most other titles in this genre, however, Just Dance does not focus on workout routines and calorie counting. As the name of the game suggests, Just Dance is all about getting your boogie on. The game gets dancing along to various songs and, well, that is all the game gets you to do. While this limitation in the game may frustrate some folks, if you feel like you would enjoy learning some cool moves to a variety of different songs, then this game might be right up your alley. There are 32 different songs programmed into the game. Most of these are pop dance hits such as “You can’t touch this” and “Who let the dogs out”. Many of these songs, as you can probably guess by the second one mentioned, would make a few people cringe. But if you do not mind dancing to cheesy tunes on occasions, or if you can limit yourself to the songs you like, the songs for this game can be a lot of fun to dance to. The game has a very simple interface and is easy to learn. When a song starts playing, a figure will begin to dance on the screen. Your job is to try to mimic the moves of that on screen dancer. The more accurate your dances moves, the higher your score. The game gives you very quick feedback on each of your moves so you know exactly how well you are doing. One downside of the game is that the moves are all preset and not customizable. This means that you will have to dance the same moves for particular songs. If you are someone who likes to do their own choreography, you may become a little frustrated by this limitation of the game. However, for those of us who need a helping hand when it comes to selecting the right dance moves, the preset move combination are a blessing. Another downside is that there are no levels of progression in the game. All of the songs are available as soon as you start the game. There are no locked songs that you have to work for. This may seem more like an upside than a downside to some people, as it can be frustrating trying to unlock song in games like Guitar Hero. If you are not so concerned about progression and just want to dance, then you can probably overlook this minor omission from the game. You can play the game with up to four people at a time. In multiplayer mode, you are able to play elimination style games to satisfy your competitive edge. If you are considering buying this game because you want to improve your fitness, there may be better games out there for you. While Just Dance is a lot of fun, your health and fitness will be improved more drastically if you invest in one of the Wii Fit games, or similar games that focus on fitness programs and nutritional advice. On the other hand, if you are not too concerned about becoming more of an athlete, or if you just want some light exercise to liven your mood each day, then Just Dance is probably what you need. With that said, it is worth mentioning that the game is still useful in terms of improving fitness. You can work up a good sweat with this game if you choose the right songs. Also, it can be purchased as part of a Wii bundle in some stores.